George W Bush has been Google bombed. Web users entering the words "miserable failure" into the popular search engine are directed to the biography of the president on the White House website. The trick is possible because Google searches more than just the contents of web pages - it also counts how often a site is linked to, and with what words. Thus, members of an online community can affect the results of Google searches - called "Google bombing" - by linking their sites to a chosen one. Weblogger Adam Mathes is credited with inventing the practice in 2001, when he used it to link the phrase "talentless hack" to a friend's website. The search engine can be manipulated by a fairly small group of users, one report suggested. 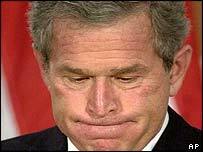 Newsday newspaper says as few as 32 web pages with the words "miserable failure" link to the Bush biography. The Bush administration has been on the receiving end of pointed Google bombs before. In the run-up to the Iraq war, internet users manipulated Google so the phrase "weapons of mass destruction" led to a joke page saying "These Weapons of Mass Destruction cannot be displayed." The site suggests "clicking the regime change button", or "If you are George Bush and typed the country's name in the address bar, make sure that it is spelled correctly (IRAQ)".